So today was National Siblings Day. If you didn’t know that, then you obviously do not have any form of social media. I’ve never seen so many old scanned family photos on Facebook in my life! It’s a mixture of trying to express love and appreciation and to embarrass the heck out of your siblings. Because no one likes to remember they once had a mullet, right? But when you don’t have siblings, you find yourself thinking the day would more aptly be named, or subtitled, Only Child Awareness Day. To be perfectly honest, I had absolutely no complaints growing up without brothers or sisters. I mean, why would I? Other than the stereotyping (no I’m not spoiled, thank you very much) and not having a scapegoat to blame for my misbehavior, it was pretty nice not having to share anything. Don’t get me wrong, I did know how to share – almost to a fault. (but my people-pleaser issues will be addressed in another post at another time) But knowing I would never be antagonized to tears by a younger brother’s pet snake wasn’t all that bad. And my imagination kept me company when I found myself in need of another player in the drama I was re-enacting back behind the house. I was the princess in my castle and never had worries that someone would try to steal my crown. But that was then, and this is now. I’ve put away my plastic tiara and stopped fighting imaginary dragons outside my tree house fortress. And I find myself wondering what it would be like to have someone to call sister. Would she look like me? Would she have brown eyes like mine, or would they be blue like Dad’s? Would her eyebrows wrinkle up just like mine when she spoke? Would she finish my sentences for me, annoying me to no end? Perhaps life would have been easier with a sister. Or a brother. Maybe I could have navigated the murky waters of my first relationship with a tad more clarity with an older brother’s advice. Maybe the future would be a little less confusing with the guidance he could offer. I don’t know. These are the thoughts of a 29 year only child. And yet, that statement isn’t true. I’m not an only child. I’m actually the middle child. Maybe that explains more than it should. But, see, there were other babies. One before I came around. One soon after I was already here. They didn’t live very long – nobody ever got to see them, hold them, name them. I don’t even know if they were male or female. Mom always told me Jesus decided to have us wait a little while longer until we got to meet them. And so, we wait. But until then, I can’t help but wonder what they see from their view. Do they cry when I do? Do they cheer me on when they see I’m tired? Have they met the children of my dear friends here on earth that had to let go of their babies much earlier than they planned? I like to think so. So. On a day that celebrates siblings, I don’t have any faded memories to share, or people to tag, but I don’t feel quite as isolated as I did before remembering that I too, do indeed have siblings. Whether it’s an older brother with the same sense of humor and a younger sister that talks too much like me, I won’t know that for a little while longer. But they’re there, and they’re mine. 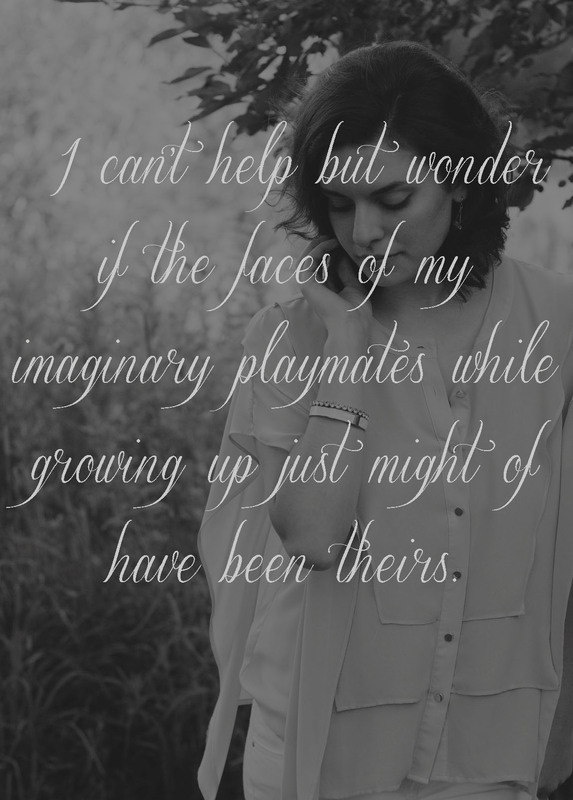 And I can’t help but wonder if the faces of my imaginary playmates while growing up just might of have been theirs.